was likely to bias the environmental review the court ordered in May 2016. U.S. District Judge Michael Simon ordered federal agencies to spill more water at Columbia and Snake river dams next spring to protect juvenile salmon and steelhead. The judge's March 27 decision, however, stopped short of banning capital spending at four lower Snake River dams. In January, plaintiff conservation groups and the State of Oregon filed motions for additional spill and to stop capital spending, not related to safety, at the four dams. The Nez Perce Tribe supported the proposed injunction for increased spill. The motions came in National Wildlife Federation et al. v. National Marine Fisheries Service et al. [01-640], the continuing litigation over federal dam operations on the Columbia and Snake rivers. The federal defendants, including the U.S. Army Corps of Engineers and NOAA Fisheries (aka National Marine Fisheries Service), intervenor-defendant Northwest RiverPartners and numerous other intervenor groups opposed the National Wildlife Federation motions. The plaintiffs asked for the spill injunction to start this spring, but Simon ruled that more planning time was needed to avoid unintended outcomes. Since the federal court ordered increased spill in 2005, spill operations at eight federal dams on the main-stem Columbia and Snake rivers begin each year on April 3. In oral arguments in Portland March 9, federal defendants said rushing the decision to increase spill amounts even further this year was problematic because changes can create eddies or other flow issues that might obstruct both juvenile and adult migration and negatively affect navigation through the locks. Intervenor-defendant Inland Ports and Navigation conceded at oral argument that a year's preparation for increased spill would resolve its concerns regarding human safety. In his written opinion, Simon said spill has long been studied by scientists and salmon managers. As examples of this, he singled out the Comparative Survival Study and a 2014 Independent Scientific Advisory Board report, both discussed by the opposing parties. Scientists conducting the interagency, multiple-year Comparative Survival Study are convinced that increased spill is significantly beneficial. While the ISAB is less certain, it and others have recommended testing increased spill. The judge said that even the State of Washington, one of the entities opposing additional spill, "acknowledged a growing scientific body of evidence and growing consensus supporting higher levels of spill. "Despite these widespread calls for testing increased spill, the federal defendants do not appear to have crafted any such experiment," Simon wrote. The judge, however, did not convince Terry Flores that a spill test was worthwhile. The executive director of Northwest RiverPartners questioned the science behind the decision and said the spill would result in higher electric bills and "do little or nothing--perhaps even harm--salmon." Northwest RiverPartners also found the court's ruling on spending at the lower Snake River dams onerous. The court decision "not only prescribes how the federal dams should be operated, but also signals the court's willingness to make decisions on what investments should be made at the Snake dams," Flores said in a statement. In his order, the judge concluded that spending millions of dollars on the four dams was likely to bias the environmental review the court ordered in May 2016. While the judge did not enjoin any pending or future capital projects, he said plaintiffs had the option of filing new motions to stop such projects. "The ruling clearly indicates a preference to remove these projects [dams]," Flores said. Proponents had a different take on the court's latest decision. Kevin Lewis, executive director of Idaho Rivers United, said in a statement it was unfortunate to have to go to court to get federal agencies to do more for endangered wild salmon. "It's equally disturbing that the federal government continues to pour tens of millions of dollars into propping up four obsolete dams on the lower Snake River. It's simultaneously encouraging, however, that a federal judge has once again agreed with us," Lewis said. 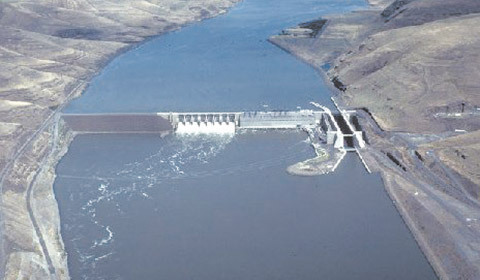 The dams affected by the spill order are the four federal dams on the lower Columbia River--Bonneville, The Dalles, John Day and McNary--and the four federal dams on the lower Snake River--Ice Harbor, Lower Monumental, Little Goose and Ice Harbor. Even though juvenile fish also pass five dams on the mid-Columbia--Priest Rapids, Wanapum, Rock Island, Rocky Reach and Wells--neither the court's order nor the litigation include these FERC-licensed PUD dams.